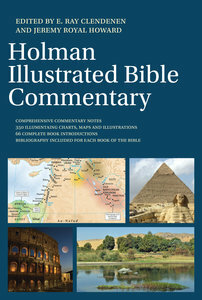 About "The Holman Illustrated Bible Commentary"
E. Ray Clendenen is Senior Editor of Bible and Bible Reference Books for B&H Publishing Group, a division of LifeWay Christian Resources. He is general editor of The New American Commentary, series editor of New American Commentary Studies in Bible and Theology, and served as associate general editor of the Holman Christian Standard Bible translation, 1998-2004. Jeremy Royal Howard (Ph.D., Southern Baptist Theological Seminary) is a writer and editor who has written Holman Quicksource Guide: Understanding Jesus, coauthored The New Eve and contributed to the Apologetics Study Bible.